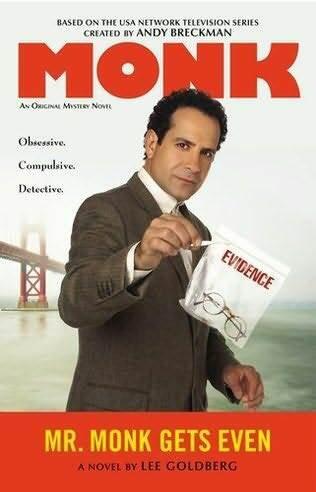 I've really enjoyed reading the books Lee Goldberg has written about Mr. Monk, the obsessive compulsive detective, and I've mentioned a lot of them on this blog. Knowing that this was the last one he'd be writing, I've held off reading it for a while because I hated to see him end his run. I know the series will be continued by another writer, and the books will probably be fine, but they just won't be the same. Goldberg managed to do a great job of giving the books clever mysteries and good characters, but he did something even more difficult. He gave them humor and heart. Not only that, but he took the characters beyond the television series and gave them lives of their own. They changed and developed over the course of the series in ways that were believable and intriguing. In Mr. Monk Gets Even, Natalie Teeger, Monk's erstwhile assistant is working as a cop in New Jersey, busting detergent thieves, while her daughter, Julie, has taken her place at Monk's side in San Francisco. Monk is, as usual, involved in murder cases, with one of them involving a serial killer. Meanwhile, his old nemesis, Dale the Whale, manages to get out of prison for surgery and then escapes, even though escape should have been impossible. Adding to Monk's troubles is the fact that for the first time, he appears to have identified the wrong killer. A further complication is that Ambrose, Monk's brother, is getting married, and of course that will be a big change for both Monk and Ambrose, who don't like change, and a lot of others. Comedies are supposed to end with a wedding, and that's what happens here. It's a fine conclusion to Goldberg's work with Monk and his friends and family. The title of the book, given Monk's proclivities and given the way that the story concludes, is perfect. My wife's a big fan of Lee Goldberg and Mr. Monk, but I haven't read them yet. Gads, I need more time for all the good books out there! As you know I took your advice and tried the books even though the television series annoyed me, and I've enjoyed every one I've read (though not all equally). I've been spacing them out so I have quite a few left to read. Who is going to continue the series? Hy Conrad will be the author for the next Monk books. Hy Conrad was also a writer/producer on the MONK TV series. He has a mystery novel out called Rally 'Round the Corpse that I enjoyed. I haven't read all of Lee's MONK books but I really liked MR. MONK IN OUTER SPACE, which revisits the cult TV series "Beyond Earth" from Lee's Charlie Willis novel BEYOND THE BEYOND (DEAD SPACE). Thank you, Bill. I'm flattered!! No flattery intended, just the facts. I've really enjoyed the series. Jack Greene, R. I. P.
Peter Meyerson, R. I. P.
You Mean It Wasn't Forrest Gump? Malachi Throne, R. I. P.
Betty Hutton Sings "Murder, He Says"
Clive Burr, R. I. P.
Peter Banks, R. I. P.